Eight players with three to four balls amongst the group. Each player passes a ball and applies pressure to the ball using the correct defensive angle and speed. 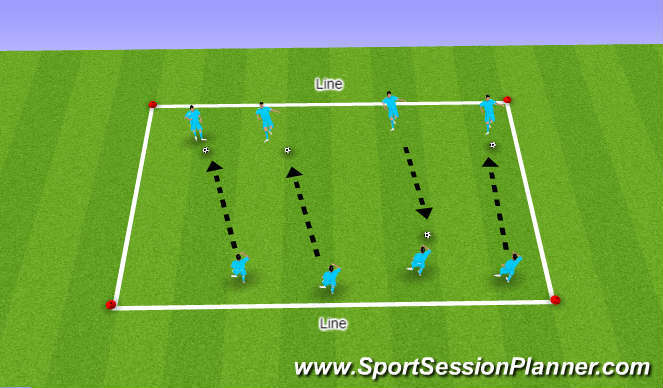 Within groups of two with one player will play the ball to their partner and then defend the line behind them. The offensive and defensive players will rotate rolls after each pass. Always start with a transition. With a coach starting play, players play 1 v 1 to goal. The shooter becomes goalkeeper, and the goalkeeper moves to attacker. Set up an area on the field 45x35 with two goals. With goal keepers, and two teams of 5v5. Teams play 3 vs. 2 in two zones. Players can cross the zone when an entry pass is made into the attacking half of the field. -Ball must be played into a forward before a shot is taken. -Once the ball is played into a forward a defender from the same team can transfer to the attacking half of the field to make it a 3 vs 4 situation. 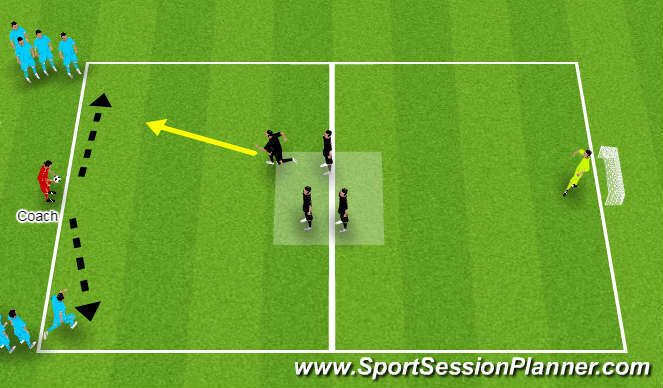 Restrict the defender entering into the attack to one of three that did not play the pass in to promote third runners. -Pressuring defender gives a visual cue to the rest of the teammates, who will react to the ball. 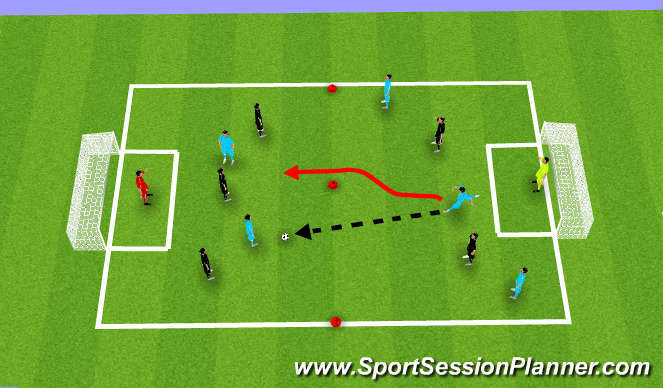 -This activity will create 1v1 situations and show the supporting defensive players their roll in the defensive scheme. -When to step and win the ball? When to contain? When to double team? Set up an area on the field 45x35 with two goals. 5v5 with goal keepers.